If there’s one thing that Peter Graham can never be accused of, it’s being afraid to get his hands dirty. The Northern saying, “where there’s muck, there’s brass”, is perfectly applied when it comes to Peter’s business acumen. After some 15 years in retail management and buying with a major supermarket chain, Peter decided the time had come to change direction. At the beginning of the new millennium, he took a complete career change and moved into the car washing business. Although initially successful the venture capitalist owners of the overall company ran out of leverage and at that point Peter realised it was time to return to the retail sector. Despite the recession, the partners set up Enviro-Works Europe Ltd in 2010, initially offering pet (Wee Away) then garden products. As the company grew and invested in additional brands, it was renamed Assured Products. Within a year, Aggie MacKenzie, the cleaning demon from the TV series “How Clean is your House?” had taken a shine to the Assured team and business really started to take off. Products are now supplied to major high street chains, pet shops, garden centres and TV shopping channels. By the end of 2012, the funding had been put to good use and the Assured team are taking control of their future. “We’ve grown from about three product lines to sixty plus; we’ve opened a warehouse and we now share a factory so we can produce our own products,” says Peter. 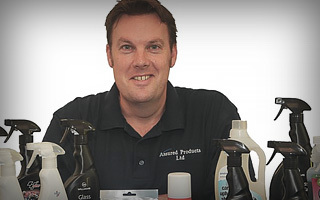 After 15 years in retail management, Peter Graham and his partner set up a company providing cleaning products for pets and gardens. Aggie MacKenzie from TV’s ‘How Clean is Your House’ took a shine to the Assured Products and they appeared in major high street shops. Expansion required funding and apart from a small overdraft facility, Peter couldn’t get any financing from the banks. Both partners were reluctant to give part of the company away to a business angel, but had heard about pension-led funding and decided to find out more. Assured Products agreed a staight loan against the business with a five-year repayment through the directors’ pension scheme and then agreed a further intellectual property purchase by the scheme some months later. By the end of 2012 the funding had been put to good use and the Assured team were taking control of their future. The product line grew from three to 60 plus, they opened a warehouse and now share a factory so they can produce their own products.